Recently, I was fully hooked on the newly-released AR game Pokémon Go, which is dramatically different from the traditional games. And I also wanna capture a game video tutorial to guide newcomers how to play Pokémon Go. The problem is that I have no any video game recorder standby. Any idea? Thanks in advance. I have been trying to make Minecraft Videos recently but I just CAN'T find a screen recorder that doesn't lag REALLY bad. I mean, I've tried screen recording software that other people say work fine, but when I try them, the LAG SO BAD! I'm on a mac, and I want a screen recorder that can keep up with the 30 fps rate. Do you have the similar experience? When you try to record a video gameplay clips on Mac, you can't find a solid screen video game recorder. Maybe many a user suggests you to have a try on QuickTime player, but the disappointing thing is that the QuickTime recorded video flashes sometimes like twice a second. It doesn't flash that much at places with fewer people, it's better at arena, and worst at bg's and dungeons. That's hard to bear. Luckily, there is a silver lining for you: have a try on the prevailing video game recorder from MacXDVD. High-end MacX Video Converter Pro has a solid screen video game recording feature to let you record video gameplay on Mac all in real-time, no lagging/flashes/distortion at all. Built-in quality and frame rate settings allow you to record game video at 30 fps, 24fps, 15fps, etc. via slide bar and High/Medium/Low quality options. Every day there are a huge amount of questions asking for the best video game recorder for Mac on many forums as the above. Rather than continually answering the same question again and again, this guide centers specifically on everything you are bound to know about a great Mac gaming screen recorder for seamless Pokémon Go video game footage capture and 360 virtual reality game recording. 1. Video Game Recording Ability : An ace gamer will always want a HD game recorder for Mac that makes capturing his Pokémon Go video games. When regarding to its recording abilities, like screen capture for games, non-downloadable YouTube video recording, Mac compatibility, microphone recording, frame rate adjustment, recorded video quality improvement, etc, they are indispensible. 2. Editing Feature: In the gaming world, players not only show off their gaming skills through recording but also want to turn a game into an exciting movie on Mac. In this case, they generally look for a game streaming video recorder for Mac with awesome editing features, allowing them to trim, cut and crop the gaming footage, add watermark to personalize it, attach subtitles for better understanding, and split or merge audio and video files. 3. Video Game Compatibility: The gaming experience is all about sharing. Whether you are going to brag about your epic battles in World of Warcraft for entertainment or create video game walkthrough for other gamers, you are destined to record game as breathtaking video for uploading to YouTube as a showoff or playing on mobile devices for sharing with friends. And a qualified digital game recorder makes it happen a few clicks and will never let system slowdowns. 4. Easiness: Perhaps nobody will refuse a Mac screen gameplay recorder that is rich in features but simple in steps. Actually gamers search for an intuitive interface that provides every function they need. With the abovementioned factors kept in mind, a great number of video game capture software are filtered out. Only a few one, like MacX Video Converter Pro, stands out from the crowd, since it is an excellent product for simple 1080p HD game recording on Mac in real time, no maddening lagging, distortion or flashes. What's better, this software offers you video quality options (High/Medium/Low) to choose from and flexible frame rate adjustment with a slide bar. And you can free select to capture video game in full screen or region with a scissor-shaped icon. The game streaming video recorder for Mac is also incorporated with an amazing gameplay footage video converter and editor, a "Add recorded movie to convert list" option allowing you to convert the gameplay footage into MP4, MOV, AVI, WMV, FLV, etc with high quality, whereupon you can have your favorite games Pokémon Go, World of Warcraft, or Super Mario Run played on iPhone 7/Plus, iPad Air 2/mini 4, iPad Pro, Samsung, Sony, Lenovo, Huawei, HTC, etc. It's also at your disposal to edit your gameplay video, add background music, or rip audio from video games, etc to create a unique game movie easily for sharing on YouTube. For a successful video gameplay capture, the tutorial will show you step-by-step guide on how to record video games Pokémon Go on Mac OS using this game video capture software. After free downloading this HD video game recorder for Mac and running it , press the "Screen Recorder" button on the main interface. In this area, you can customize the video game footage by selecting "Keep Full Screen" or "Crop Region". Moreover, before you capture game videos on Mac OS, you have the choice to select the quality of video game to be recorded, tweak the video frame rate, record audio of any game, and alike. Tip 1: As an insurance for smooth video audio game recording, it's advisable not to adjust any setting in System Sounds as the suddenly increased volume would hurt your hearing. Tip 2: you can record video game with sound from microphone. If you want to record video gameplay clips with system sound, you need to install an add-on to work together. Click "Browse" button in output setting area and select a destination folder to save your captured gameplay. Hit "Start Record" button to begin recording game on your Mac. You can stop the screen capturing process at any time. This game recorder won't affect your Mac computer's performance during recording. Once you get the recorded game on your Mac computer, you can import the game footage into the software and choose to convert it to your favorable format, media player or web sharing site like YouTube for playing or sharing. Besides game capture, this all-in-one digital video recorder for Mac also performs well in recording videos from YouTube, capture streaming videos, etc with full screen. 1. Resolution. Higher resolution will result in larger video game output file. But the higher the resolution, the better your video quality will be. For a larger video, you can use smaller resolution. Anyway, it's a trade-off. 2. Framerate. A consistent framerate is needed while recording your game video. To produce a more consistent video overall without lagging bad, it's advisable to set your frames per second smaller. 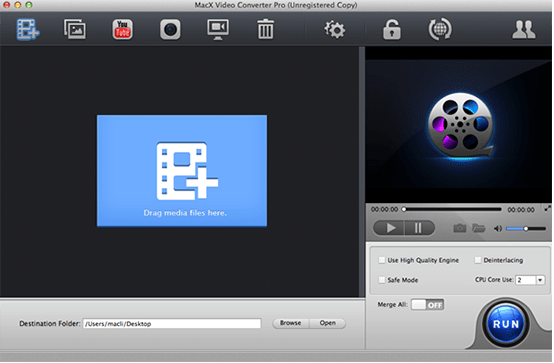 MacX Video Converter Pro is a feature-rich, high quality video game recorder for Mac users to record HD video gameplay footage in real time without the annoying lagging or flashes. Besides, it can auto convert recorded game video to MP4 MOV MKV AVI FLV WMV, etc. formats for YouTube uploading or mobile device, game consoles transferring.